Givology Event in Union Square, NYC - Make Your Mark on the World. Make a Pledge, Educate a Child. 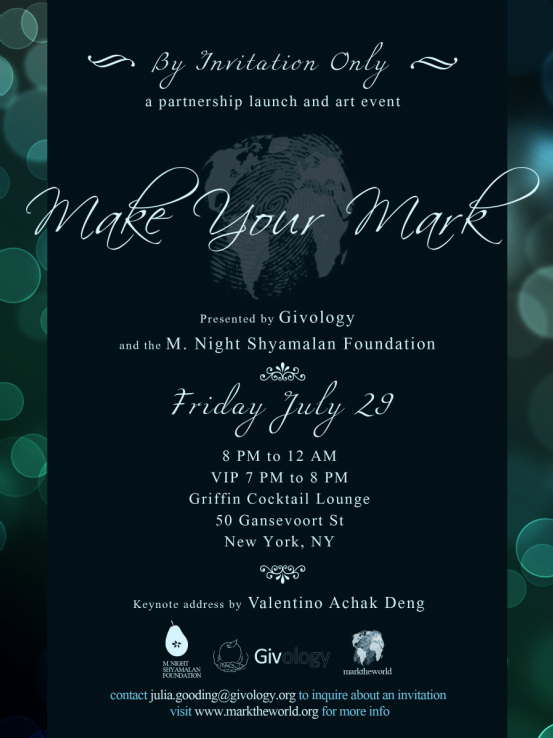 Givology and the M. Night Shyamalan Foundation (MNSF) will host “Make Your Mark on the World” on Friday, July 29th from 8PM to 12AM at Griffin, a cocktail lounge located in the Meatpacking district of Manhattan. This exclusive, invite-only event celebrates the new partnership between Givology and MNSF. Givology and MNSF will welcome the MNSF co-founders M. Night and Bhavna Shyamalan, members of the Givology board, as well as partners, supporters, friends, and media at “Make Your Mark on the World,” a partnership launch and art exhibition event. By invitation only. To inquire about an invitation, contact Julia Gooding at julia.gooding@givology.org. VIP Access: 7PM to 8PM – RSVP required for guest list. Main Event Access: 8PM to 12AM – By Invitation Only, RSVP required for guest list. Can't make it? No problem, we still need your help! Make a donation to Givology today! Valentino Achak Deng's life has been described by The New York Times as a testament "to human resilience over tragedy and disaster." Born in the village of Marial Bai, in Southern Sudan, he was forced to flee in the 1980s, at the age of seven, when civil war erupted. As one of the so-called Lost Boys, he trekked hundreds of miles, pursued by animals and government militias, and lived for years in refugee camps in Kenya and Ethiopia. He eventually resettled in America, to a new set of challenges. Deng's life is the basis of Dave Eggers' epic book What Is the What, which Francine Prose calls "an extraordinary work of witness, and of art." In 2009, as part of his Valentino Achak Deng Foundation, he opened the Marial Bai Secondary School, the region's first proper high school. Valentino Deng spent his formative years in refugee camps, where he worked as a social advocate and reproductive health educator for the UN High Commission for Refugees. He has toured the United States and Europe, telling his story and becoming an advocate for social justice and the universal right to education. In 2006, Deng collaborated with Dave Eggers on What Is the What, an international bestseller that is now required reading on college campuses across America. With Eggers, Deng is co-founder of the Valentino Achak Deng Foundation, which helps rebuild Sudanese communities by providing educational opportunities and facilities.